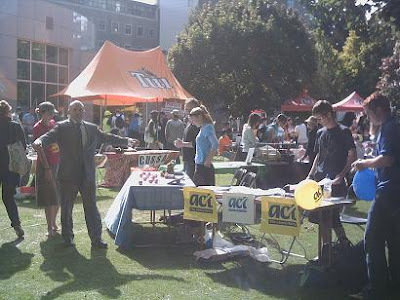 Checked out Clubs Day at Canterbury University today. Rick from Silent Running and the KLUB was manning the ACT on Campus stand, with Andy, Trent, Scott and Rodney. The boys signed up 40 odd members and did some preliminary coalition negotiations with some of the other parties on hand. I had had some good talks to some of the new members. They're a diverse bunch, ranging from a very switched on Ayn Rand fan from Australia to a couple of very well informed guys from the Christian Union-one was a long time New Zeal reader. Also had a good talk to Marc Alexander from the Nats-(ex United future MP). He's standing against Jim Anderton in Wigram and is hoping that favourable boundary changes and the swing against the left will give him a fighting chance. My only disappointment was missing my mate Byron from the Workers Party. I went over to say hello, but he'd buggered off. Scott set us up a prime spot. Hey, I am not from Australia! We need more flyers to hand out, flicked off the lot of them yesterday. Hope you're up early, I'm driving past. That's about 80 brand new people interested in hearing more about the ACT brand. Add to that the score or so at Lincoln University yesterday too. How many new members did Young Lab sign up? They'd be lucky if it was 10. Yep, signing up for the Labour Youth isn't the most cleverest thing to do, esp this year.